In less than 12 hours post launch, So That Happened hit #24 on the Amazon’s Best Seller list for Medical Biographies! Thank you, thank you for supporting my story and subjecting yourself to my inner dialogue. Interview and film production by SurvivorNet Media. There’s no way to predict when cancer will show up. 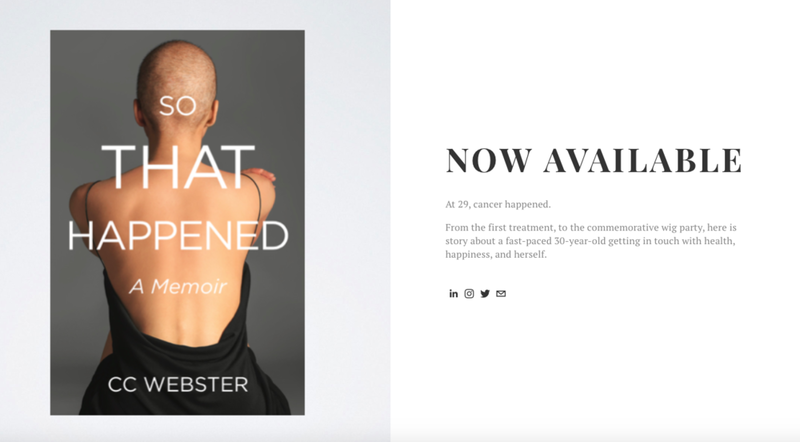 CC Webster was in her prime - in her 20s, living in New York City and working at a large advertising agency when she was diagnosed with Hodgkin lymphoma. It turned her world upside down, she says, but also allowed her to see what was truly important – and she saw the value in documenting her experience for others. The result was a book, “So, That Happened, A Memoir”. "At the time of initial diagnosis, my relationship was very young. One week, we were going on a date to a French restaurant for dinner, and the next... we were counting eggs before chemo." Here is an ode to the ones that sit next to the chemo chair, hold sweaty hands, run 40 blocks to make yet another appointment, who sit next to the bed, and who ultimately change the way we see ourselves. Here’s to you. EXCLUSIVE FIRST INTERVIEW. CHECK IT. "So what does it all mean, Basil..."
My editor and I decided to shoot the breeze and answer this question, but this time on film. Catch my very first interview with her to hear about how we met, why the hell I wrote a book, and the meaning behind the message. And no, we are not drinking. Interview by Stephanie Gunning, Editor and Publishing Consultant. CC describes herself as "one of the lucky ones." Diagnosed with a rare lymphatic cancer at age 29, she went through a year of transformation -- experiencing things that are common among people who have survived cancer, but also recognizable to anyone who has faced hardships with their health or in their lives. What happens when a girl and her oncologist talk all things cancer? We get unfiltered insight into the emotional story along with the physical facts. From dealing with the shockwave of that diagnosis, to exploring my relationship with my health, we learn that healing goes far beyond that last drip. It's mind and body, people. Now up on Weill Cornell Medicine newest podcast, CancerCast, hosted by my incredible oncologist and head of the WCM lymphoma program, Dr. John Leonard. Listen the full interview on RadioMD here. Featuring CC Webster, Hodgkin lymphoma survivor and and patient of Dr. John Leonard, Weill Cornell Medicine. Want to get in touch? Submit a review? Ask questions? Please do! I would love to hear from you. Sign up for the newsletter to get sneak peaks, first dibs, and exclusive previews on news, features, and events.